The grass is growing, the sun is shining, and the grill is warming up – it’s time to promote your summer and sporting events! 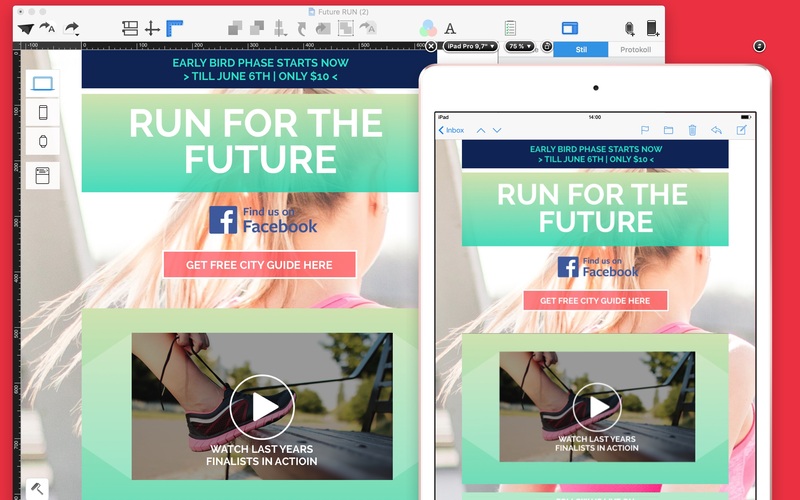 Today, we would like show you how to overcome your Inner Email Grouch with Mail Designer Pro. With these invitation newsletters tips, you’ll make your mark. It’s better to receive an invitation well in advance. In truth, there is probably nothing more exciting than getting a secret V.I.P. invitation or a “SAVE THE DATE.” These newsletter with teasers, dates, and facts. Essentially, your “Early Bird” specials should include some kind of V.I.P. discount, better seating options, or some other rebates or bonuses. Don’t forget: Include a “pass it on” special in your newsletter. Additionally, it’s best to create for your event a Facebook page. For a recurring event, we recommend a generic title without a date. For example; “Munich Run Series“ (That way it can be used again). Your “VIPs“ can take part in the event via Facebook and help you to win new fans and “likes”. Should it be even more exclusive? Without using Facebook, another trick is to announce to your recipients that it’s an invitation-only event. Further, you can add that that they must show the invitation upon entry. This shows exclusivity and that you regard them to highest of importance. Welcome to life! Undoubtedly, you can use big lead pictures to your benefit. Big lead pictures with brilliant backgrounds are necessary to get your recipients into the mood of your event. With Mail Designer Pro, you can easily set pictures as complete backgrounds and post dates and infos on top. And the best part is, you can even create a stunning, mobile friendly, Retina-optimized version. Find more tips for mobile optimization here. Also, you can try to link backgrounds and teaser graphics to your event landing page or the sign-up page. This way, you can persuade your recipients as to why they must come to your event. Together with this, you can even feature guest stars and the best scenes from the past year. Including a teaser video of the last event is also a great way to attract attention. Try adding a Youtube link or integrate a link from your own video server. Are you touch-ready? Although your email design may be awesome, most people will quickly scan your invitation in action mode on their high resolution smartphones. That’s why it’s important to ensure your event invitations are just as attractive for mobile displays as they are for desktop screens. Together with our tips, you’ll see how much of a difference a little incentive makes. Your click rate is sure to be pushed to the limits!